“To see or not to see its shadow” is the question of the day on February 2nd. It’s officially Groundhog Day when this small creature predicts the oncoming seasonal weather. According to legend, if it is a sunny day and the groundhog sees his shadow and gets scared, he will go back into his burrow to sleep, which means there will be six more weeks of winter. Now, if the day is cloudy and no shadow is seen, the groundhog will remain outside, indicating that spring is on its way. As part of your Groundhog Day lesson, invite the children to dramatize this legend with these cues. Have the children pretend to be groundhogs curled in a ball (on the floor) in a winter home. It is February 2nd. Awaken and stretch. Crawl from your home. Look outside! There’s a black shadow on the ground. Ooooo! Crawl back into your home and sleep for six weeks. Or, the groundhog sleeps in a ball in his home under the ground. The weather warms. Slowly awaken. You are very hungry because you have not eaten throughout the winter. Crawl from your home and look for grass or clover to eat. Spring is coming! If weather permits, take the children outdoors on a sunny day and help them to discover their shadow. An adult recites this verse and the children do the actions. My shadow sits beside me. Try to change the shape and length of the shadow. Discuss other ways shadows can be made. Think about bright lights, flashlights, and even when the full moon is shining bright. Discuss why there are fears about shadows. Give explanations for shadows to help remove fears. Tell the children to pretend they are groundhogs. “It is the time that you have awakened and are looking outside your burrow. What do you see?” Invite the children to draw and color a picture of what they see on this day. Share each picture with the group. The children can make pop-up puppets using paper cups and tongue depressors. The paper or foam cup can be decorated with markers and/or stickers. On the tongue depressor, the child can draw the face of a groundhog. Cut a slit in the bottom of the cup and insert the stick. The child can raise or lower the groundhog by pushing the tongue depressor up and down from under the cup. Here’s a little groundhog furry and brown. If he sees his shadow down he goes. Then six more weeks of winter snows. Draw a face and body part for the groundhog (see photo). Have the children color and decorate this drawing as they wish. Cut out the two pieces and glue the face part onto the bottom flap of the lunch bag. The body can be adhered to the front panel of the bag. 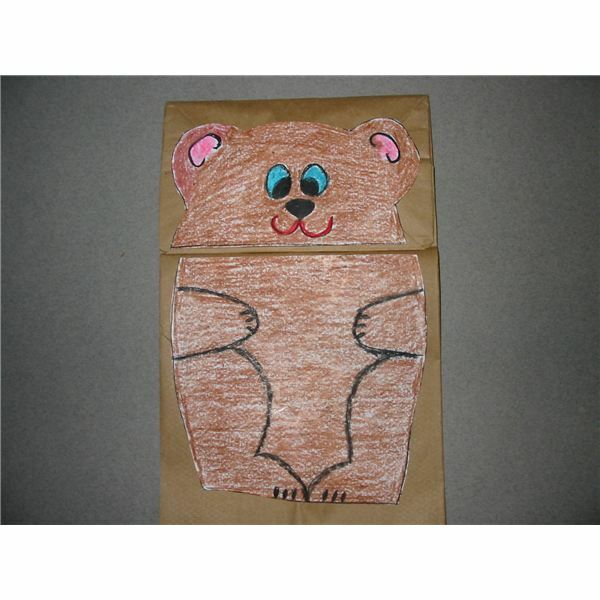 Children can place their hand into the bag and manipulate this puppet. Punxsautawney Phil is the world’s most famous groundhog. He is the one that the television networks and national publications set up to see and film. Phil lives the life of the rich and famous as he resides in a custom designed den at the Punxsautawney, Pennsylvania library. He is a tourist attraction and once a year he treks up to Gobbler’s Knob for the shadow ritual which has been a tradition since 1886. Visit the official Punxsutawney Groundhog website for more teaching ideas in their “Teacher’s Corner.” There are coloring pages, puzzles, songs, games, cookie recipe, and other activities. Information and activities offered in this article are based on the author’s personal experience in the preschool classroom and the official Punxsutawney Groundhog website.